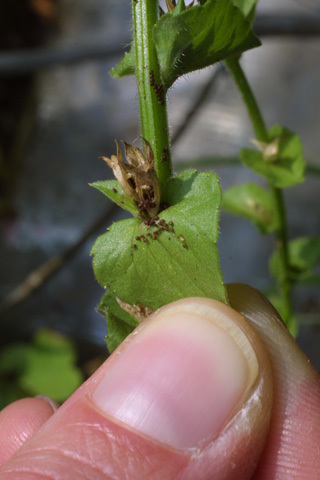 The ripe capsule of Impatiens explodes when touched, scattering the small seeds away from the plant. Here are the remains of an exploded fruit. When ripe, pores in the side of the fruit open, allowing the tiny seeds to shake out. 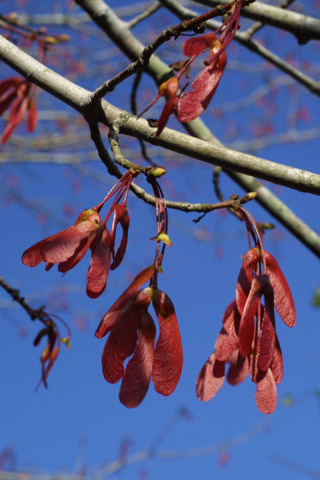 Acer rubrum (red maple) - Maple fruits are winged, two-seeded samaras. They spin like helicopters as they fall from the tree, providing a longer time for dispersal by wind. Liriodendron tulipifera (tulip-tree) - The flowers bloom high in the tree. 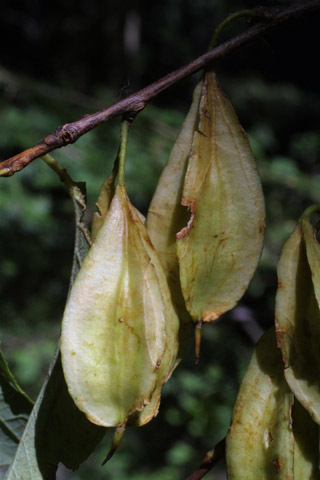 As each winged fruit peels off the outside, it flutters to the ground. 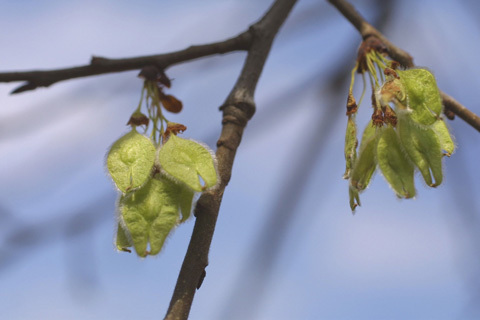 Ulmus americana (American elm) - The wings of the one-seeded samaras form partly from the persistent and enlarged styles. 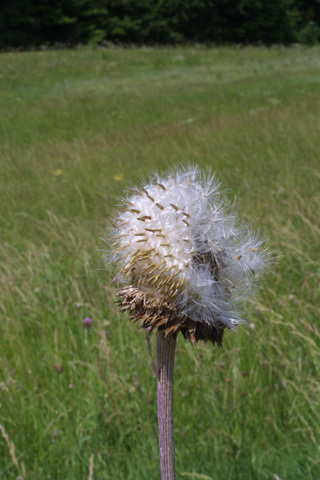 Carduus nutans (nodding plumeless thistle) - The dry, one-seeded fruits are carried on the wind by plumose "parachutes". 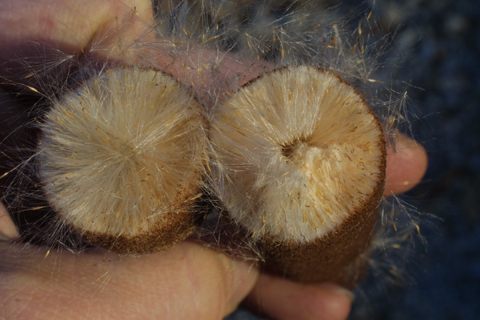 Typha latifolia (broadleaf cattail) - The brown "head" of a cattail is composed of dense, radially arranged "parachutes". 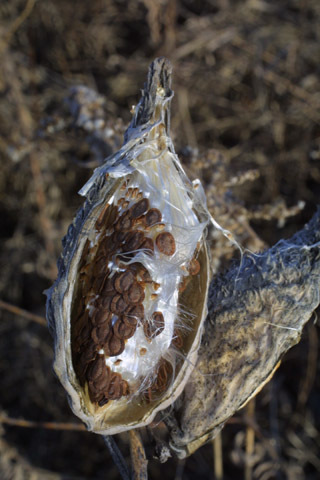 Asclepias syriaca (common milkweed) - The densely packed fruits peel away and are carried away by the wind. 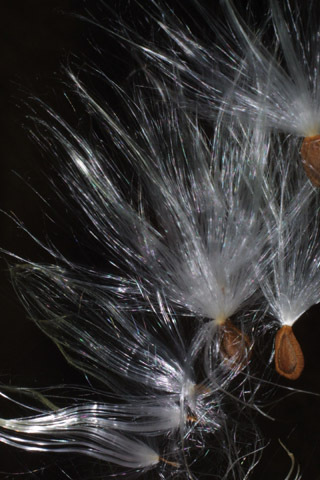 Tragopogon dubius (yellow goatsbeard) - The pappus forms parachutes. 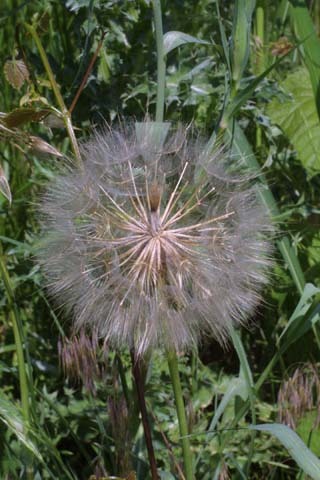 This is a typical strategy for members of Asteraceae family, such as the more familiar dandelion (Taraxacum officinale). 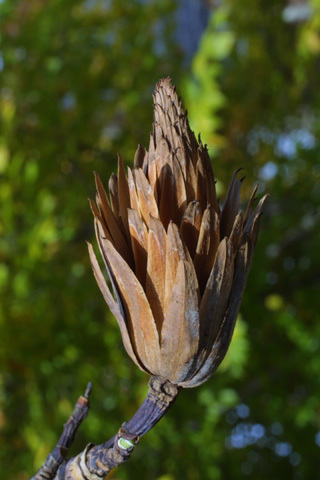 The seeds of many plants are dispersed after passing through the digestive system of animals that have eaten the fleshy fruits. 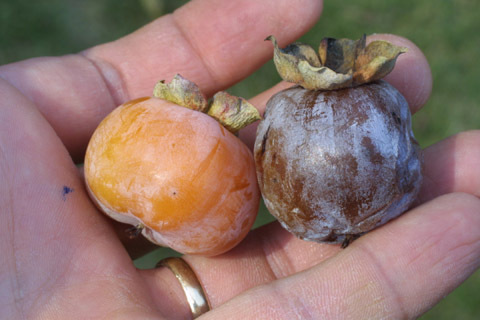 Diospyros virginiana (persimmon) - The sweet fruits are enjoyed by many animals including humans. 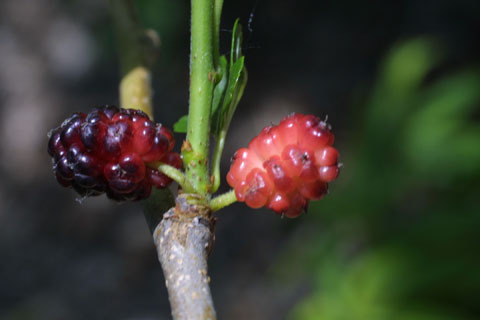 Morus rubra (red mulberry) - "Berries" contain many small hard seeds. 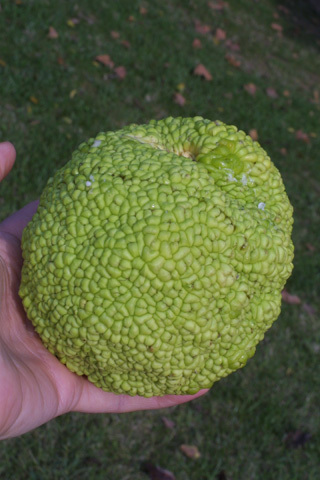 Maclura pomifera (Osage orange) - These huge fruits ooze sticky, white latex when bruised. They are large and hard - what would want, or be able to eat them? 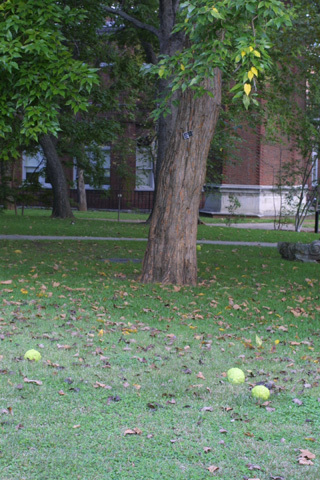 Maclura pomifera (Osage orange) - The fruits pile up under the trees, waiting for a disperser that will never come. 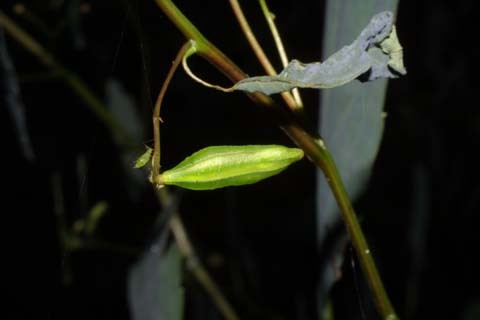 It is believed that Maclura fruits were probably once dispersed by extinct megafauna (large mammals) that died out soon after humans arrived in North America. 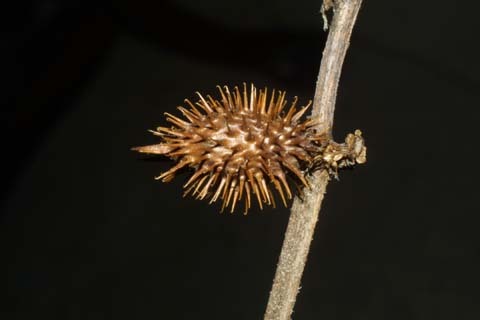 Hard nuts are usually destroyed if chewed or eaten. However, animals such as squirrels may cache them to eat later and fail to recover them, giving them an opportunity to germinate. On rare occasions, birds such as blue jays can transport acorns long distances. 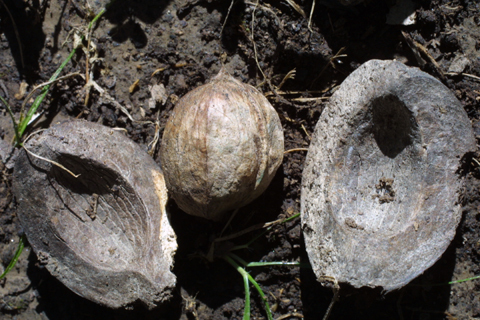 Carya ovata (shagbark hickory) - Hickory nuts form inside husks that split open to release them. 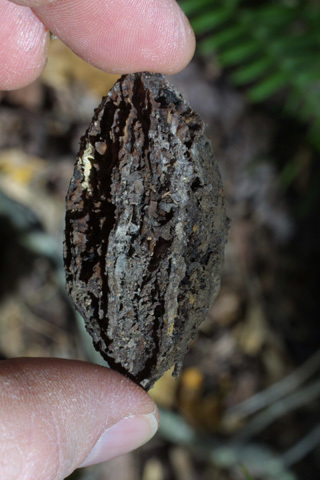 Juglans cinerea (butternut) - This formerly common congener of black walnut is now rare due to a fungal disease that has devastated the species. 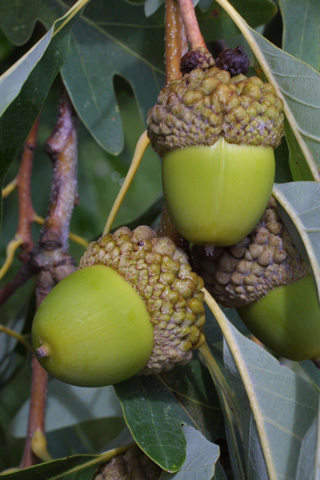 Quercus alba (white oak) - These acorns have few bitter tannins and are favorites of squirrels. 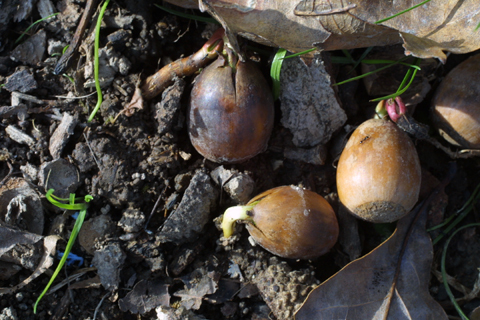 Quercus alba (white oak) - If they are not destroyed by predators, white oak acorns can sprout rapidly after falling from the tree. 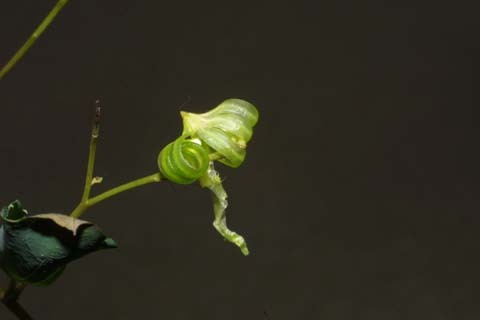 Some species of angiosperms use hooks on their fruits to attach them to the fur of mammals or feathers of birds. 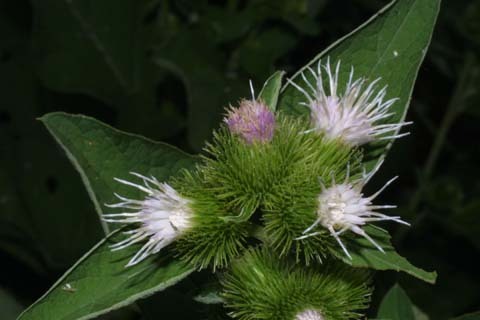 Arctium minus (lesser burrdock) - The bracts of the inflorescence have hooked tips .